We have reached vlog number twelve, and it is marked by another one of Elton’s signature songs from the early 1970’s. Take Me To the Pilot was released as the second single from the Elton John album. It was the originally released as the A-Side to Your Song; however, disc jockeys much preferred the a-side and it inherently got much less play. 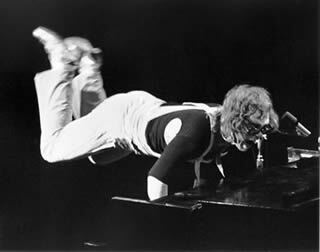 None-the-less, Take Me To the Pilot, has been a staple throughout Elton’s career, appearing in most of his live performances. As much as the song is musically a very straight-forward rock song, the lyric could not be less straight-forward. Elton has often said in live performances that he has absolutely no clue as to what the song is about. Bernie too has indicated that there is really no true meaning behind the lyrics and that he just threw together lines that sounded good next to each other. To me, the song has is suggestive of someone who is facing down demons whether they be societal or personal. There is definitely an element of confrontation of some sort in the song. Regardless of what the song means or how Elton plays it, I hope you enjoy my rendition. Please feel free to share your comments!